Scientists have discovered something positively frightening on one ice shelf, something they didn't even realize was there. Scientists have just stumbled upon a major discovery in Antarctica, and an incredibly alarming one at that. Researchers at Columbia University’s Earth Institute have found that melting is occurring at a much faster pace than had previously been thought, and it’s only likely to increase. 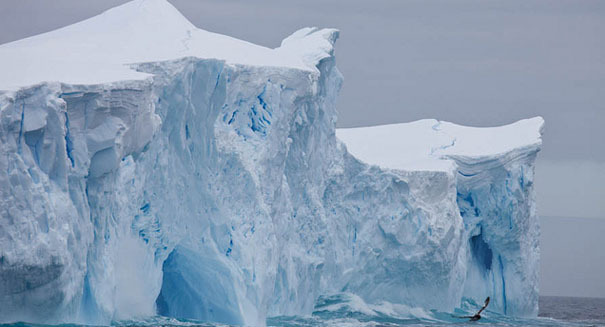 The findings, which were published in the journal Nature, stated that there was an extensive amount of meltwater drainage that was flowing in parts of Antarctica where they didn’t expect it. The Earth Institute also provided video showing a 400 foot wide waterfall as a river of water cascaded down the Nansen ice shelf and into the ocean. The Nansen ice shelf is a huge glacier that is 30 miles long and 10 miles wide, and the discovery indicates that the problem is not in the future, but very much in the present. And with temperatures continuing to rise, it’s likely to only get worse. However, the data was too sparse in locations to determine if the number of drainages have been increasing over the last seven decades. ~ Would someone tell Trump the world is flat and he should take a walk to prove it? Including walk all the way to the end and take one more step to prove it. The libs knew this before, and Obama’s last-minute sky is falling act was just a stunt to pin it all on the right and make people panic and blame the current admin when they don’t want to enact the crippling environmental laws. Liberals are sure there is no God, and think believers are ridiculous because they have no concrete proof. Liberals believe that man has caused unprecedented change in global climate. Offer no concrete proof. So right those of you who know that climates change. Without mankind’s influence. A natural cycle over thousands of years it repeats. Fools want to throw money at ti. So right those of you who know that climates change. Without mankind’s influence. A natural cycle over thousands of years it repeats. Fools want to throw money at it.